In special press conference, family of soldier who shot wounded terrorist condemn how he has 'already been convicted,' demand a fair trial. 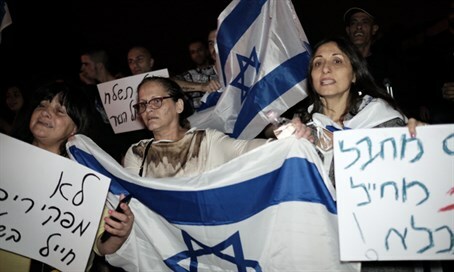 The family of the soldier who last Thursday shot a wounded terrorist in Hevron held a special press conference on Saturday night, in which they claimed he has already been convicted by the press and the politicians. "All that we ask for is a little understanding and compassion," the soldier's sister said, speaking on behalf of the family. The soldier was filmed by an Arab camerawoman of the radical leftist NGO B'Tselem shooting the terrorist on the ground, minutes after the terrorist together with an accomplice stabbed and wounded another soldier at the site. Following the video the soldier was arrested, and on Friday in a military court hearing he was accused of murder. The soldier has explained that he shot the terrorist because he thought he was about to detonate a bomb belt, in a version of events confirmed by a witness at the scene who said there were concerns the terrorist had explosives hidden under his coat, which he wore despite it being a warm day. In further vindication of the soldier's account, on Friday a second video emerged taken at the scene, showing several people expressing concern that the terrorist “looks like he has an explosive pack," and warning others to keep clear of him until a bomb sapper arrives. "My soldier brother a year ago received a certificate for being an outstanding soldier," explained his sister on Saturday night. "He is a dedicated, patriotic soldier who loves the state, and is disciplined and courageous." She continued, saying, "we are a family that grew up in a mixed city (of Jews and Arabs). My brother has friends from all the communities in the city, and he was not involved in any radical acts, and never in the past did any extremist actions." "Everyone has the right of being innocent (until proven guilty), but my brother has already been convicted and I fear that he will never have a fair trial. It is important to me to tell all of the wide public that strengthens us in recent hours not to take part in this awful lynching, my brother is not the terrorist, my brother is the soldier." Politicians including Defense Minister Moshe Ya'alon (Likud) and Prime Minister Binyamin Netanyahu rushed to condemn the soldier last Thursday, followed shortly afterwards by the UN. Initially on Thursday only three MKs - Avigdor Liberman, Oren Hazan and Betzalel Smotrich - voiced support for the soldier, although on Friday after the second video was released several others came forward.